Unwittingly snapped by a sandwich shop paparazzo, Panera Bread iMac Man took center stage in our corner of the internet for one day in December. More pictures surfaced, but our questions remained unanswered. So we got in touch. Well, actually, he got in touch with us. Going in, we knew only what we could see: he uses his iMac in Panera Bread; he plays lots of World of Warcraft; he's a riddle wrapped in a mystery inside an enigma dressed in a plaid shirt. His photos were viewed by over 100,000 people on our site, and countless more elsewhere. He is Panera Bread iMac Man. We now know that his name is James, he's a cheery fellow, and he works as an administrator at a large non-profit. Here's what he had to say, when I talked to him over a sandwich at his local Panera Bread. Ok ok ok, my phone. But still! 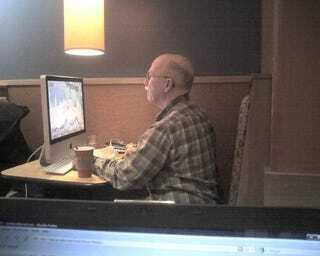 Why do you bring your iMac to Panera bread? This could also be phrased as, what do you have against laptops? I've got nothing against laptops! At my age, I appreciate the bigger screen. The same dollars would not have gotten me a laptop with screen that size. I got an iLugger to carry it around; I grew up with the original mac, so I'm used to the weight. I don't have an internet connection at home, so I use Panera's. At that particular Panera, I can drive my car, park it underground, and walk right up without exposing the iMac to any weather. Do the people at Panera give you a hard time? Did they accept your computing habits right off the bat, or did it take time? No, no. What [the photos] don't show, is that all around me are people with computers. There's usually about 50/50 on Macbooks, iBooks, and PCs. What level is your World of Warcraft character? I couldn't see from the screen which one that was, but I have three characters—two level 80s, and an, oh, I guess one level 14. How'd you get into WoW? The reason I started playing WoW was because of my niece's son, who was 9 years old, was playing at the time. I started playing in self-defense. Are you enjoying your marginal internet celebrity? How did you find out you'd been snapped and posted online? I was looking though MacSurfer, and saw the title. I sent the link to my buddies, and I was like, "that damn photo makes me look bald!" It comes as a shock, though. About six months ago, a guy walked over to me, and he had done a sketch. He asked, "is this OK?" Now I have it framed, sitting on top of my counter. Thanks for talking to us, James!